Muscle Shoals is not a major tourist destination. It lies on the southern shore of the Tennessee river in the northwestern part of Alabama, on the other side of the river from the town of Florence, AL. These days, the name seems to refer to the area covering the towns of Sheffield, Tuscumbia, and Muscle Shoals itself. While many people who consider themselves rock-and-roll aficionados may know nothing about this place, other than it being a reference in a Lynyrd Skynyrd song, people who are really in the know understand that this was the place where a lot of rock-and-roll music of the 1960s and 70s got created. Musicians from all over the country, and the world, came to the studios of Muscle Shoals to record their albums. Musicians like Rod Stewart, Paul Simon, Jimmy Buffet, Willie Nelson, Aretha Franklin, Bob Dylan, Eric Clapton, Lynyrd Skynyrd, Percy Sledge, Etta James, The Commodores, The Rolling Stones, The Allman Brothers, and many others, worked here. Wandering around the area of Muscle Shoals you will not have a clue as to the role this place had in the creation of the contemporary music of that time. Some of the place, especially around Sheffield and Tuscumbia, looks run down and dilapidated. The town of Muscle Shoals is lightly populated, with low rise and spread out shopping centers and commercial buildings dominating the skyline, and it is clear that the history of the place has not had a very significant impact on its prosperity. The original recording studio that started it all is called Fame Studios. It is still in use, and is owned by a family that has been in the business for over fifty years. The building that hosts the facility is small and nondescript, and you may even miss it if you were not paying attention, in spite of the fact that is is right beside the main road. The inside of the building shows its age. It is simple, and the decor is from a time that has long passed. The walls are covered with pictures and mementos of the musicians who have worked in that space since the 1960s. The Muscle Shoals Sound Studio was a spinoff from the Fame studio and it was started by the Swampers. It operated in the location indicated in the picture below from 1969 to 1979. The building is now a museum, and it sits all by itself in an open space beside Jackson Highway. There is nothing else of note there beside this unremarkable building. One would even miss the small building had the name of the place had not been painted on it. The parking lot is small and unpaved, and an unmarked entrance from a side street (rather than the main road) leads you to the facility. We came by another place of note called the Cypress Moon studio unexpectedly, next to a park beside the river. Apparently this facility used to house the Muscle Shoals Sound Studio after 1979, but this lasted only a few years. Cypress Moon Studios are a film and music production company today. Concerts are held periodically in the historic studios. Driving along Jackson Avenue, you pass buildings that are falling apart that have names on them indicating that they were recording studios some time in the past. It is hard to say if the place ever thrived due to the presence of the music business, but today most of it looks rundown. Unfortunately, we had no time to spend wandering within any of these facilities. The museum would have been interesting. There is something interesting about how life goes on in Muscle Shoals even though its best days have probably passed it by. While the place is open to tourism, it is also very low key at this time, and there seems to have been no attempt yet to try to exploit the situation with a lot of advertising and promotion on a large scale. Expectations seem to be moderate. Life goes on, and the pilgrimage goes on! We spent a couple of hours (literally speaking) in downtown Huntsville, AL. I think that is sufficient time to see this particular area of town and get a good feel for it. The downtown area is small. The place reminds me of other small places with downtown areas that are recovering from hard times. The buildings are old, and perhaps historical. The central area in Huntsville is dominated by the Madison County Courthouse, a building whose design leads me to believe that it was probably a product of the 1970s, a time when public buildings seem to have been designed to be primarily utilitarian and functional, and not very noteworthy from an artistic perspective when seen from the outside. The buildings around the courthouse in Huntsville house small mom and pop boutique stores and restaurants, and lawyers’ offices. Old people lounge around in the benches watching the tourists. Young people with laid-back attitudes serve you in the restaurant whose outdoor tables are painted in psychedelic colors. I have seen this kind of a scene in other small towns with rundown downtown areas. Perhaps these young people with their seemingly simple lives and a straightforward attitude will bring a rebirth to these towns. The Harrison Brothers Hardware Store lies to the south of the courthouse. It is a historical facility that still functions as a store today, and in some sections of the store you can see shelves and tables stacked up the way they used to be in past times. But the thing that got me was the historical cash register which is still being used! The metal work on this piece of hardware is something to be seen from close up. The only other thing I will mention here about Huntsville is the statue outside the courthouse. It is a memorial to the civil war, and it is a memorial to the confederates, the side that lost the war. Statues like this started coming up all over the south in the early 1900s, well after the civil war was over. 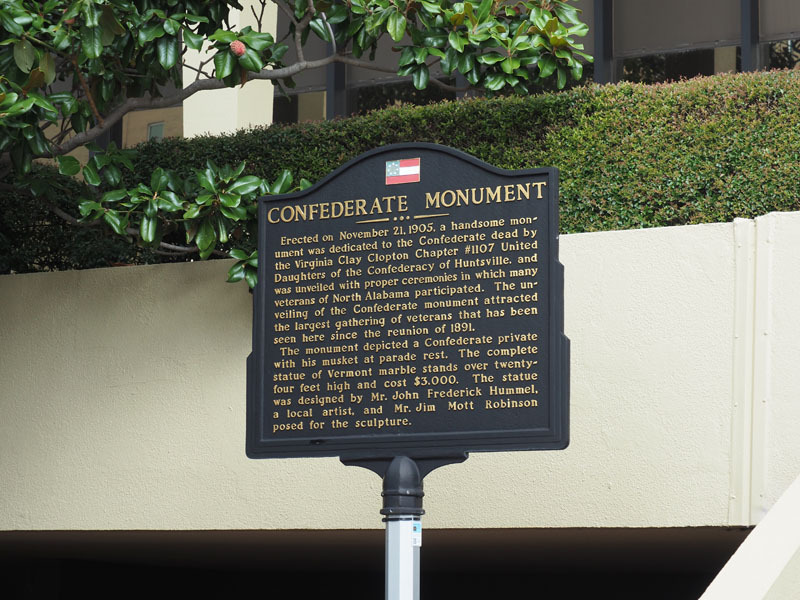 From what I understand, they were built primarily by a group called the United Daughters of the Confederacy. Unfortunately, these statues have now become an uncomfortable reminder of our still ongoing issues with race, one of the major issues of this country that the civil war sought to address. Statues of confederate leaders are being torn down from many public places today, mostly in the north, because they are symbolic of our ongoing societal problems. It will probably be a while before such a movement takes hold in the southern swathe of this nation. Huntsville is also called The Rocket City, and it is the place where the American space program got its beginning. If you are visiting the city and have time to spare, there are things to be seen in this regard. We did not have the time. By sheer coincidence, we happened to visit a few historical locations last week that are associated in one way or the other with the American Civil War. The practice of observing a Memorial Day in the United States came into being as a formal way to remember the people who had lost their lives in this war. The first place we visited during our travels last week was Gettysburg, the location of the civil war battle where about 51,000 lives were lost in a single encounter over three days of fighting. The battle marked the turning of the Civil War, when The Union finally began to push back The Confederacy. It was also the place where Lincoln gave his famous Gettysburg Address. The first picture below is from a section of the famous Battle of Gettysburg Cyclorama. The cyclorama can be seen at the visitor center in Gettysburg. The next place we visited was Harper’s Ferry, the location where John Brown, the abolitionist, raided the local armory and helped to ignite a process that eventually led to the civil war. Being at the confluence of the Shenandoah and Potomac rivers, the town played an important role during the civil war itself. The last place we visited were the fields of Antietam where the bloodiest single day battle of the civil war was fought. About 23,000 people lost their lives in about 12 hours. These days Memorial Day serves as the day to remember all the men and women who have given up their lives to serve the country in various wars and battles, but mostly it seems to be a day for people to consider the beginning of the summer season. Barbecues are fired up for the first time, swimming pools are open, and yes, there are good sales in the stores. Sadly, we have still not learnt our lessons about wars in general.